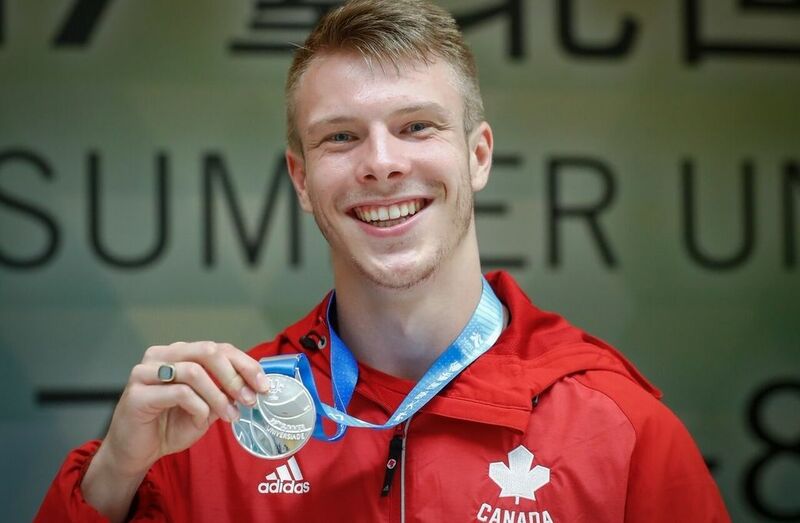 Canada’s first medal in athletics at the Taipei Universiade is silver, with sprinter James Linde crossing the 200m finish line in second place. The final race was tight, with Frenchman Jeffrey John (20.93) just ahead of the Trinity Western University student (20.96) and Slovak Jan Volko (20.99). Only one other Canadian athlete took part in a final on Saturday night, with Paige Ridout finishing seventh in the pole vault event. After the first day of the women's heptathlon, Dallyssa Huggins is seventh, while Nicole Oudenaarden sits in 15th place. Several Canadians also made a good showing in their semifinals today. Among others, Brittany Crew and Sarah Mitton made history in shot put, qualifying for the final tomorrow. This is the first time that two Canadians have reached the final round of this event at the Universiade. In the women's 1500m, Regan Yee has qualified for the big show on August 28. Tyler Smith (men’s 800m) and Sekou Kaba (110m men’s hurdles) will both advance to the semifinals of their respective events tomorrow.